With over 6 decades of experience, several successful venue’s, thousands of events world wide, multiple national titles in Flair & Cocktail competitions and millions of satisfied guests, the still young and vibrant directors of Barmazter, Clinton Weir, Robbie Viglietti and Jeff Herbert are leading the event and hospitality industry with a unique beverage catering concept. 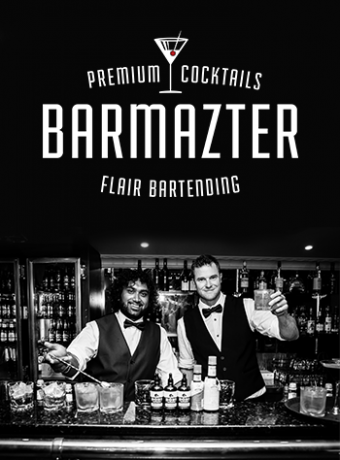 Barmazter is Australia’s Premium Cocktail and Flair Bartending Service Company. Specialising in Professional Cocktail and Flair Bartender hire, World Class Flair and Fire Flair Bartending stage shows, Internationally Acclaimed Cocktail and Flair Training and State of the Art Mobile Bar hire. Barmazter is a team of highly skilled and passionate bartenders who ‘do what we love and love what we do’. Prince William and Princess Kate at Buckingham Palace for the Royal Wedding after party // Roger Taylor and Brian May from Queen at Rogers wedding in UK // Jamie Oliver // Black Eyed Peas // Tom Cruise // Leonardo Di Caprio // Anil Ambani, Kishor Bajaj & Maharajas in India // Ellen DeGeneres private Cocktail party – Melbourne 2013 // Katy Price & Alex Reed, England // Cathy Freeman.